We are the leading manufacturers and suppliers of the Brass Anchors Fasteners. Brass Loop Loc Anchor measure 13/16 diameter x 1-5/8 tall and are the same barrel size for all manufacturers. Actual screw thread may vary from one manufacturer to another. Anchors ship complete with barrel and screw. We aere leading manufacturer, supplier and exporter of Brass Anchor Fastener.We manufacture all range of this product. For more details feel free to contact us. Pioneer in the industry, we are engaged in manufacturing an impeccable range of Brass Anchor Fastener. 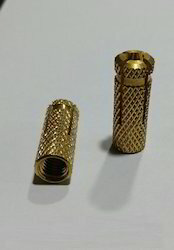 We manufacture brass anchors, which are corrosion resistant which enables use in all type of enivornment. This brass anchors ensures equal expansion of segments from all side while screwing. Lubro Air Engineers Pvt. Ltd. Matching up with the requirements of our clients, we are involved in offering Brass Anchor Fastener. To serve the requisite requirements of our precious customers, we are engaged in providing a qualitative range of Anchor Bolt Fastners. Features:Expansion assured through driving the hardened pin through the slotted anchor base with Hexagon nut and captive washer.Uses:Fixing of brackets, stadium seats, wooden rafters, machine bases.Base Material:Concrete, Hard Stone.Material:Carbon steel, electro-galvanised to 5 micron. SS 202, 304, 316.Hardened steel for pin.